Luxury condominium connected to Ala Moana Shopping Center. The site is uniquely located adjacent to the Nordstrom wing. 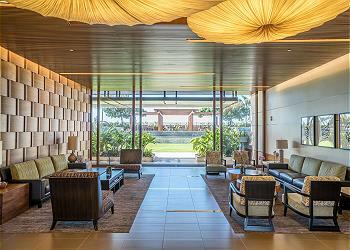 Direct link to Ala Moana Shopping Center, Infinity Pool is an impressive luxury condominium. It is surrounded by plants in Hawaii though it is in the center of the city, so it has full of resort feeling! Trolley bus stops and bus stops are also nearby so it is conveniently located for both shopping and restaurants. The common facilities are also substantial, including pool, jacuzzi, sauna, fitness room, golf playroom, recreation deck, party room with kitchen, library, private theater room, BBQ grill, kids area, yoga studio and so on. Please enjoy elegant Hawaii stay.